When I first conceived of the idea of stripping, despining, scanning and tossing all my cookery books, the first book I stripped was this one. It just happened to be on the top of a pile of books that didn’t quite find their way onto the bookshelf due to lack of space. Heartbreaking as it is to cut up books with a craft knife (and a little dangerous I might add) there really isn’t an optimum way of laying out a book and photographing the pages. You’ll always get shadows, and then of course you’ve got to OCR the pages to recognise the words. It’s a pain. When I scan the pages into my Mac, I use ReadIris Pro to recognise the pages and format them to PDF. They are then searchable, making it easy to find recipes based on ingredients. Genius or what ! I couldn’t have chosen a better book to start with. I don’t think there are many recipes in this book that you’d leave out. First time round (before Christmas) I made maybe 15 recipes from this book. I just wasn’t blogging then. This time round I have chosen 10+ dishes that are different from last time. Hopefully I have photographs from the lap of the book; if I do I’ll share them with you. 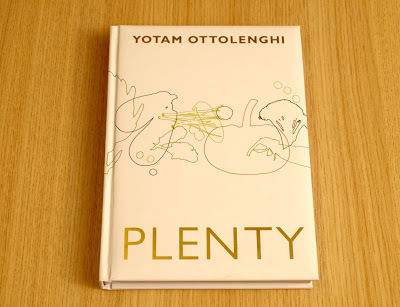 For those of you that have not heard of Yotam Ottolenghi, he is the master of all things Middle Eastern. He has has a couple of TV series and has featured on Australian Masterchef, The Taste, and often writes in the Guardian. He’s not a vegetarian but his recipes clearly reflect his preferences towards eating less meat and more vegetables and pulses. He uses lots of traditional Middle Eastern ingredients like dried limes, freekeh, sumac, za’atar, moghrabieh and pomegranate molasses. The ingredients aren’t always readily available from supermarkets but I didn’t have to look too hard to find most of them online. I was also lucky enough to get an Ottolenghi cook box for Christmas from Freya’s mum with lots of ingredients in it. Which kind of made it easier. Nothing in this book takes long to make, and he always precedes each recipe with a tiny tidbit about how the recipe came into his hands and why he likes it. It’s a very special book – it was a shame to cut it up. I hope they are as good as they look! This entry was posted in Authors/Chefs, Books, Plenty, Vegetarian, Yotam Ottolenghi and tagged Books, ottolenghi, plenty, recipe, vegetarian by tenuoustoaster. Bookmark the permalink. I just made the Avocado, Quinoa and Broad Bean Salad but with some delicious twists… http://sexykitchensecrets.com/2014/05/20/quinoa-salad-with-avacado-snowpeas-radish-lemon/ , its really good, I make the sweet potato wedges on a frequent basis…I also hope to make more out of this book! happy cooking!